I'm very excited. I've got two things that I'm really pleased with to share this week. Both of them are sewing projects and both of them are making me really happy right now. First let's talk hexagons. 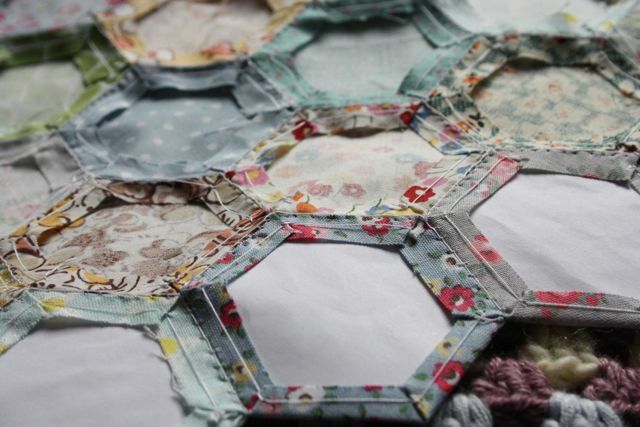 I think I'm smitten with hexagons. 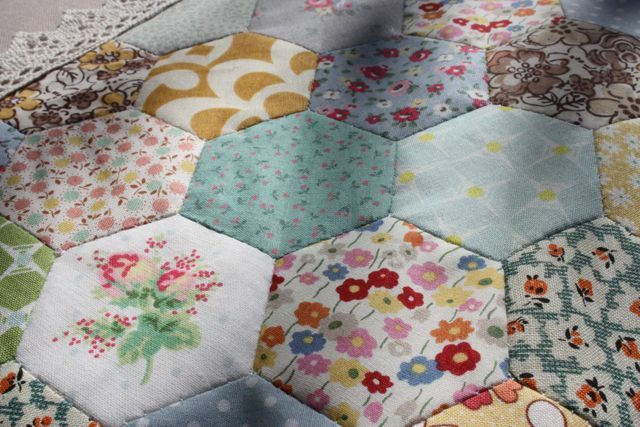 Were you here when I talked about my rediscovery of patchwork hexagons? Well, no-one was more surprised than me to discover that not only could I stick at hand sewn patchwork, I enjoyed it too. A lot. So, it wasn't long before the pull of those tiny, beautiful little hexagons were tempting me in again. I started seeing them floating around the internet again and I succumbed. I wanted to make a new cushion anyway, so it was perfect timing. Plus the fact that it means I get to play with lots of heaps of beautiful colours again. My favourite! I don't know what it is about piling hexagons up? Crochet squares or circles are the same. These heaps make my heart leap for some reason. Happy stacky, that's me! There's some adorable fabrics in there too. I'm afraid I'm not very certain on what a lot of them are, so if you see something you love, I'll try and help but I'm making no promises. You see those fussy cut flowers in the middle there though? That's Cath Kidston fabric, which I got about two years ago and they make me very happy indeed. But, what to make with them. Well a cushion, yes, but what exactly? My original idea was to have one big hexagon clump in the middle, with maybe two or three rings of hexagons around the centre point. When I arranged it though, it didn't look quite right. It seemed to sparse at the edges and my 'clump' didn't look right. Then, it stuck me. I had the idea! Hexagons and bees. Bees make honey, in combs, hexagon shaped combs. I was onto something I liked at last. It's a busy, buzzing bee on a Beehive Cushion and oh yes, I love it so! It's one of my most favourite things that I've made I think. That's how much I love it right now. 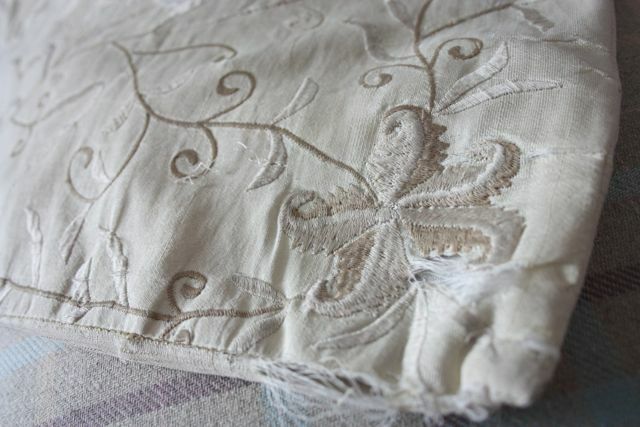 I even managed to reuse the zipper from the much loved, but very old and tattered cushion cover that it replaced, so that was pleasing too. It's going to live here really, that's what it was made for. But for now, I'm going to leave it sitting in the sun. Because it was a lovely day, the day I took these photos and it looks very happy in the sun. And, I think the bee prefers it too. hello! A new reader/follower here and i have cushion envy... a very strange feeling. it's just the right amount of whimsy, cracking idea! I love your cushion, it is gorgeous! Also, can I be cheeky and ask where you got your tweedy chair?? I guess, I'm going to make one for myself someday. 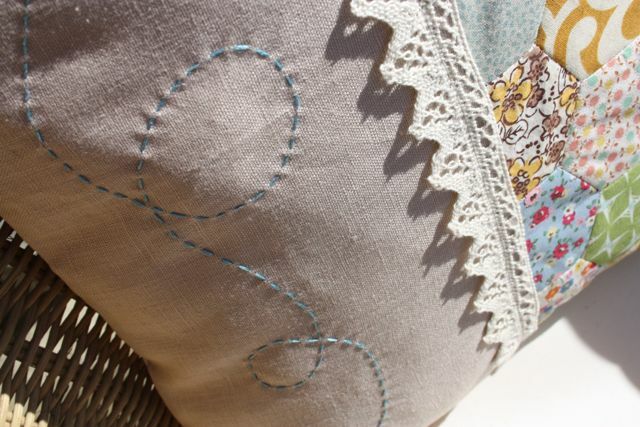 Oh, and the crochet lace trim - just perfect! Your cushion is absolutely gorgeous, I love it. Oooooooh I LOVE it!! Wow, so cute! I don't know how you do it, everything you make is so amazing!! This is absolutely beautiful! 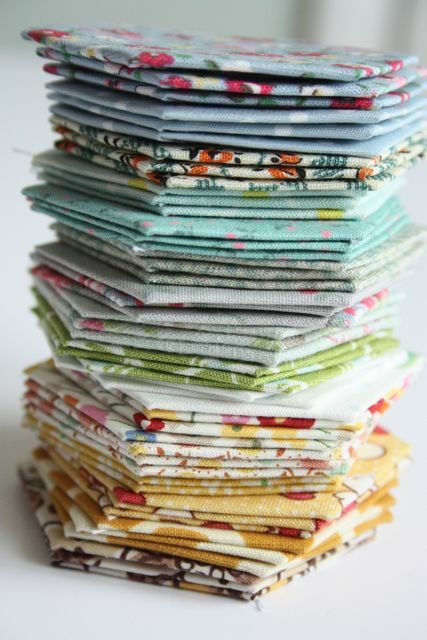 I love the fabrics & colours and the bee is so sweet. I have a thing about bees at the moment as I'm trying to plant more bee friendly plants in my garden and on my allotment. Absolutely beautiful! I love your choice of fabrics and colours and the bee is so sweet. I have a soft spot for bees at the moment as I am trying to plant more bee friendly plants in my garden and on my allotment. I absolutely love this! 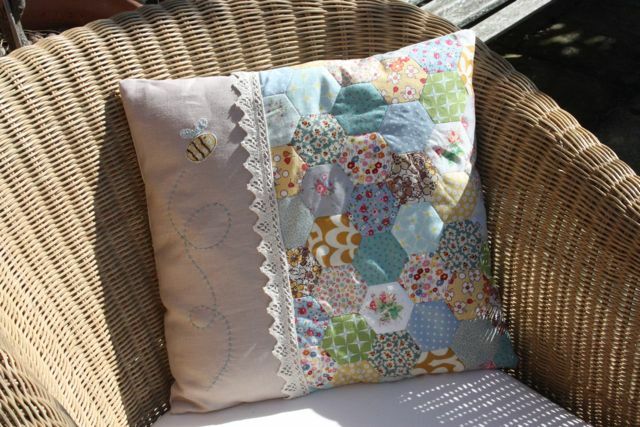 I also love bees and I could see this pillow on my sofa! This is wonderful! How clever are you? 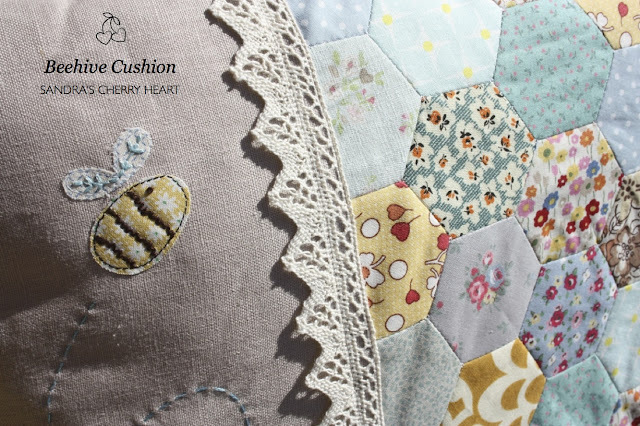 The bee is just delish and the patchwork devine! Yep!!! You are addicted. I will send the doctor over right away...hehehe. 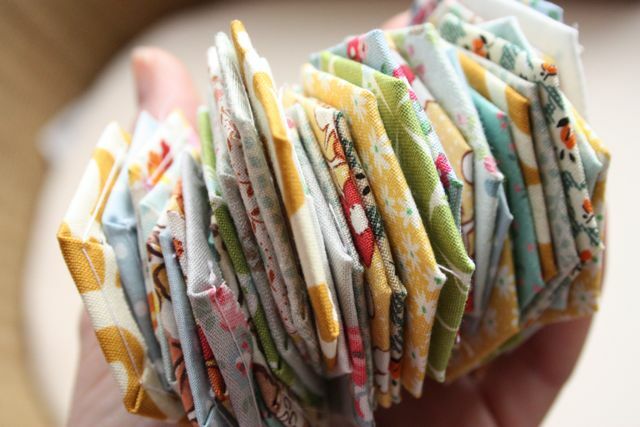 You are officially the crafter that makes my jaw drop! It either drops or I gasp everytime I see your finished results! 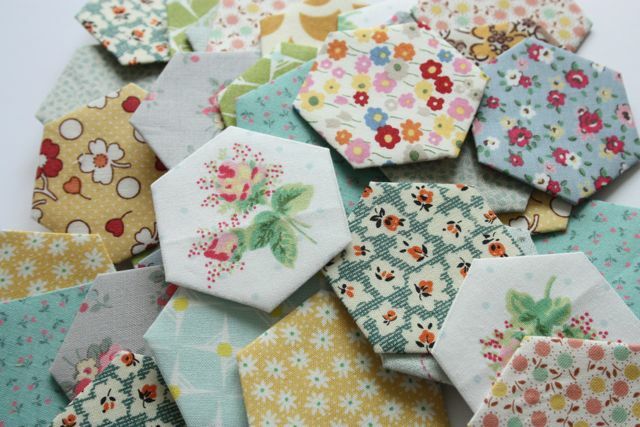 I have a hexagon cushion underway at present and keep going though how it's going to look in the end in my mind.. I certainly haven't come up with anything as brilliant as this! Просто шикарная медовая тема! Мне очень нравится! Well, Happy Stacky, that's one beautiful cushion.........the little buzzing bee is perfect.......isn't it great when a plan comes together. Absolutely GORGEOUS! The bee idea is inspired - well done you. Love it! Hello, I'm just starting on my first hexagon adventure, and seeing your beautiful cushion has really inspired me to get mine finished. It's a lovely idea bees and honeycombs together. 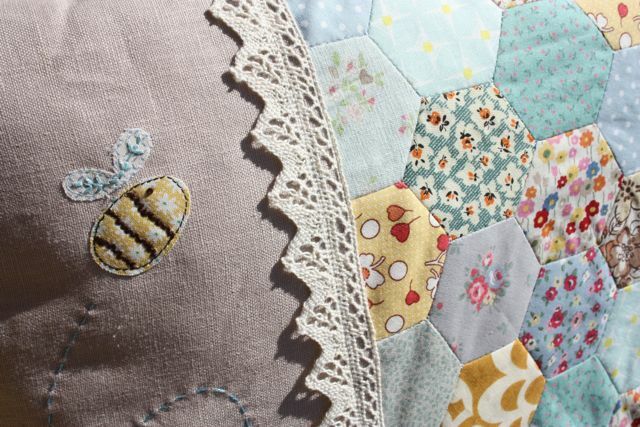 It's just perfect, two of my favourite things, hexies and bees! It really is just beautiful thanks for sharing. 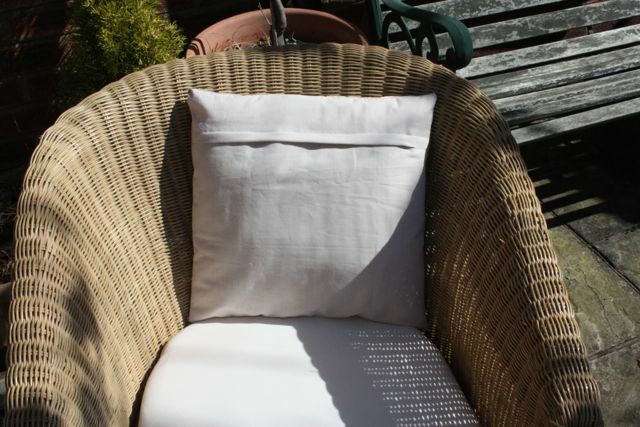 Wow Sandra, what a gorgeous cushion.....you are so talented. I love the bee detail! I love this pillow! I'm inspired to make one just like it for my mom for Mother's Day. :) Thank you! Hello dear Sandra! 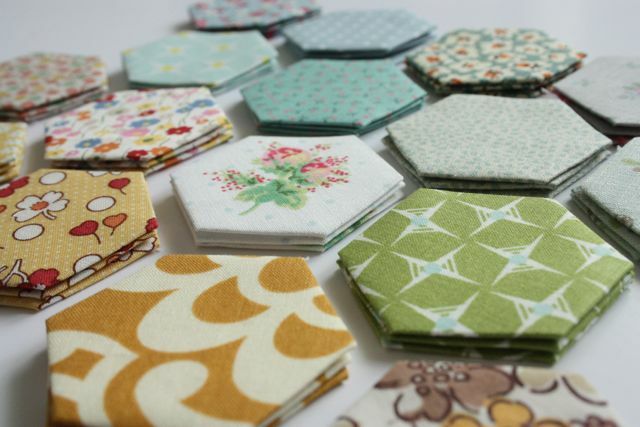 Your hexagons and fabrics are so sweet! Oh, I LOVE your gorgeous cushion!!! You did a beautiful job with it! 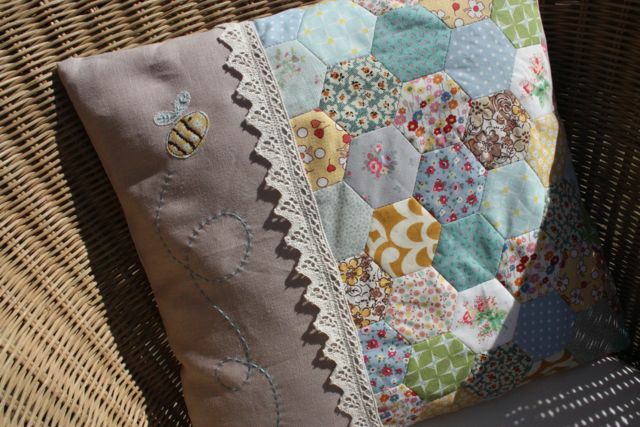 Yes, bees are a perfect match with the hexagons and I love your little appliquéd bee! You are so creative and sew beautifully! 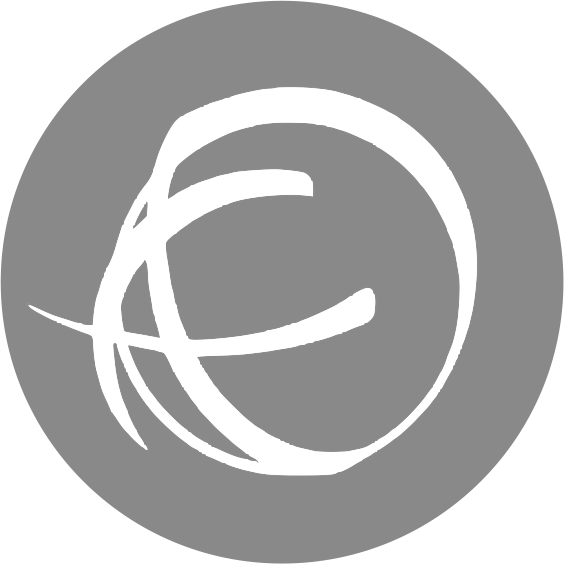 Look forward to seeing your next project. xo~Paula... The cushion matches your new chair perfectly! That is so great! Plus your hexagons are covered in bees. What cold make a fabric bee happier then fabric flowers? 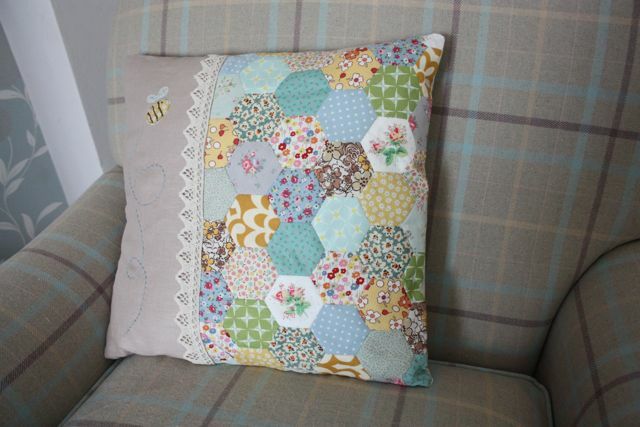 What a beautiful cushion ... and I love the link from the hexagons to the bees. By the way pop over to my blog if you want to see my finished 'cherry' cardigan ... I know you have a soft spot for cherries! That is the sweetest pillow! This is so pretty. The embroidery is absolutely the perfect addition. Your pillow is adorable! So nice colors and beautiful fabrics! Great finish work :-) J.
I am just a strippy quilt maker usually, simple squares machined together, but your lovely cushion (and enthusiasm) have inspired me to try some hexagons again..
Hi! This cushion is great!